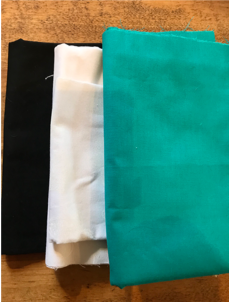 Improv Minis !- On February 2nd please bring a fat quarter of a black a solid and a white colored fabric as well as your machine. We will also be collecting the blocks for the Quilt mentioned in last month's minutes and presenting our word of the year quilts. The first retreat payment will also be collected. 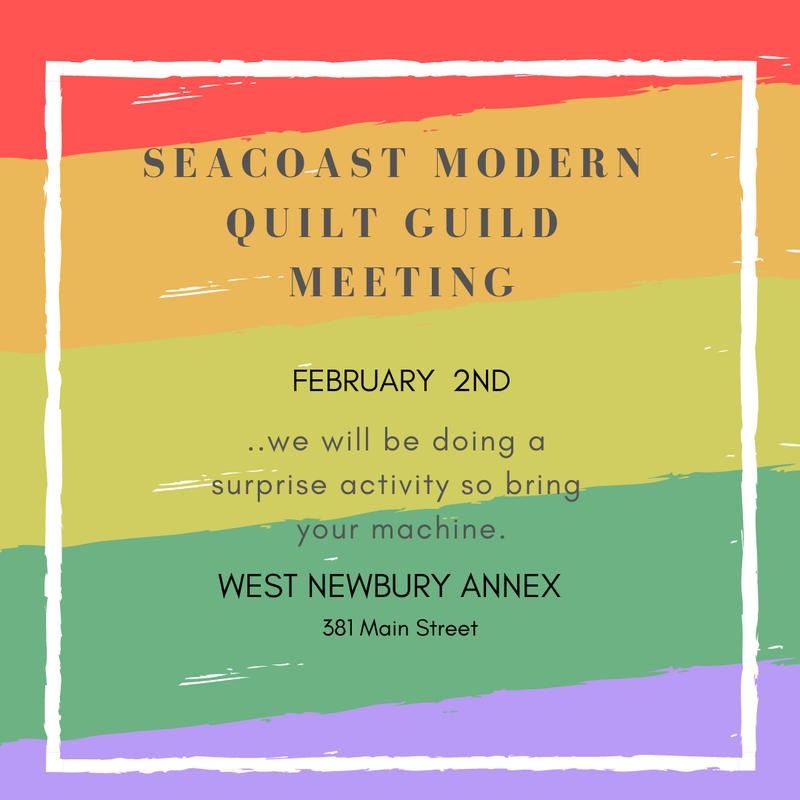 Surprise Activity at our February 2nd guild meeting! and black, white and a solid color fabric as well as a rotary cutter. It can be a solid or almost solid like a white on white. We will have cutting stations and pressing station set up. We will be meeting at the West Newbury Annex. 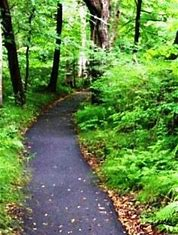 We hope you can join us for our 2019 Retreat on May 2-5 at the Franciscan Guest House in Kennebunk, Maine. It's a fun-filled weekend that includes dedicated sewing time, group activities, swag/raffle/prizes and lots of laughs. Below are the room rates, which include breakfast provided by the Franciscan daily. The Retreat Committee will host Friday evening dinner. Lunch is on your own and we are planning an off-site dinner at a local restaurant on Saturday evening for those who would like to attend. Our January meeting at the Wiggin Memorial Library in Stratham, N.H. drew 24 people. 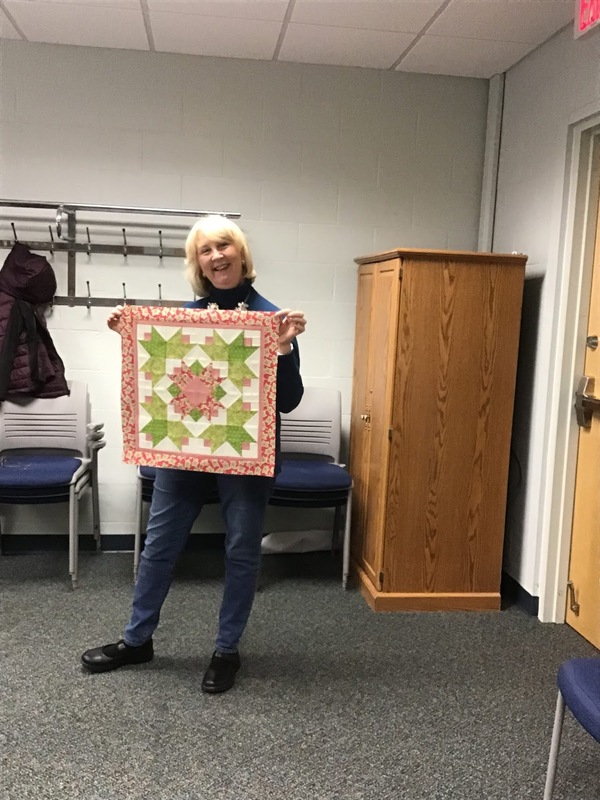 We discussed several upcoming events, including the October show at Strawbery Banke, a display at the Festival of Trees, and workshops with Rebecca Bryan. 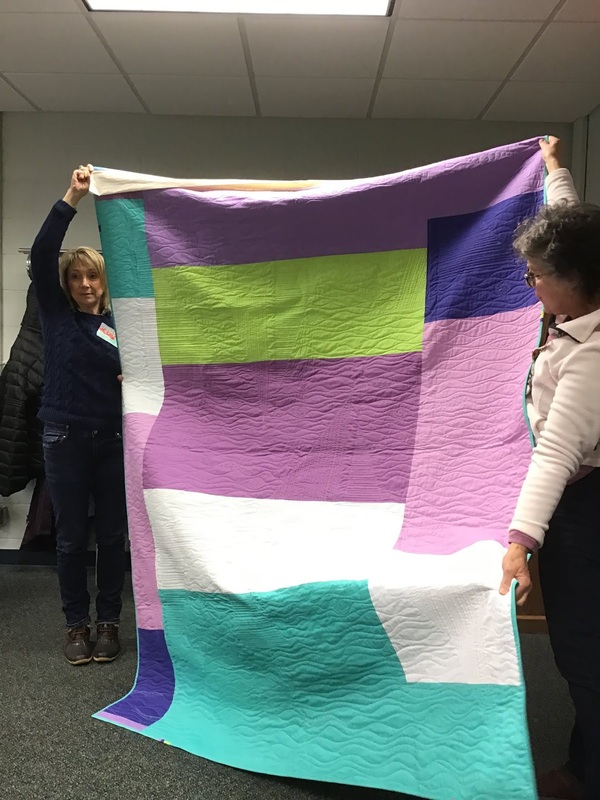 We voted in favor of acquiring a membership to the New England Quilt Museum and were reminded that our members can take advantage of resources from the Modern Quilt Guild, including webinars. See here for the MQG web site. As outlined in the previous blog post, we are embarking on a "Word-of-the-Year" project. Diane and Nancy gave us lots of information on how to piece, applique, or embroider our chosen word. We are suggesting that people use a gray or tan background with a final size of 10.5" x 14", but we are also happy to see the different directions that people go with this project. 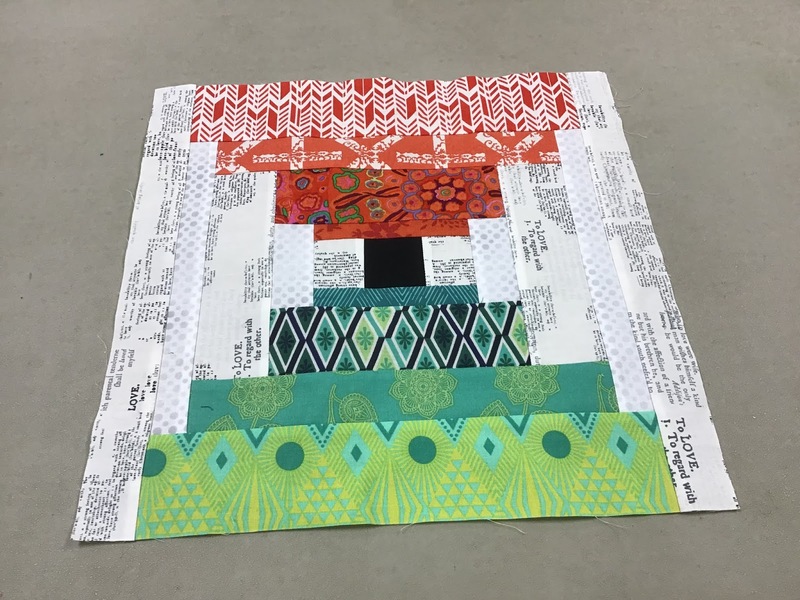 We will be making a quilt for Colleen's daughter who had a fire at her house. The pattern is Bright Birch Trees by Amanda Jean Nyberg of Crazy Mom Quilts. Block size (before finishing) is 16" x 16" and they will be collected at the February meeting. More information on the specifics of the block construction can be found on the SMQG email list or at this tutorial. A reminder that we are still collecting Courthouse Steps blocks for Judy D, our past president. She has asked for scrappy prints and solids in all colors (including low volume). The center should be a black square. The example below caught my eye because of the way the corals and greens play off each other. Many projects were displayed during Show and Tell. 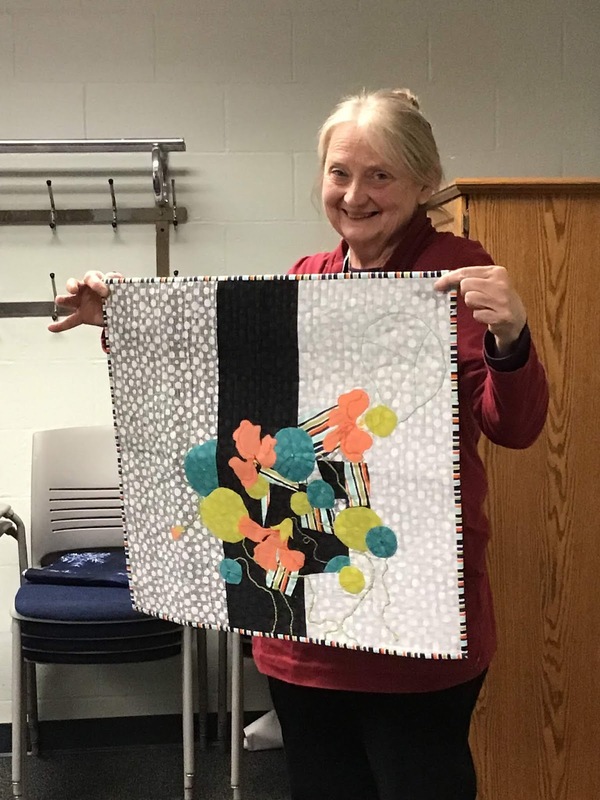 Jane shared the biggest quilt she has ever made, a queen-size "Swoon" made from a Camille Roskelley pattern that Jane began last February. 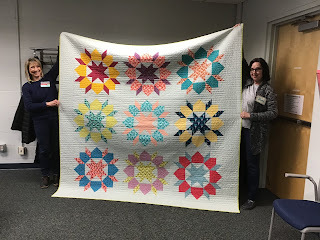 I love the vibrant colors in this quilt (especially the yellows). Diane shared two pieces. The first (above) was made as part of a Michael Miller challenge. The second (below) has been juried into a craft show in Exeter. 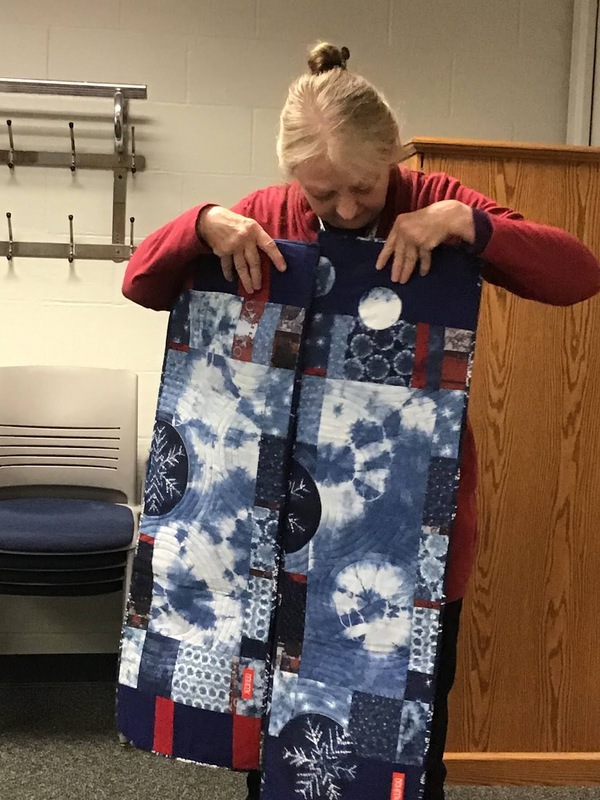 It includes a mix of commercial fabrics and fabrics she dyed herself. 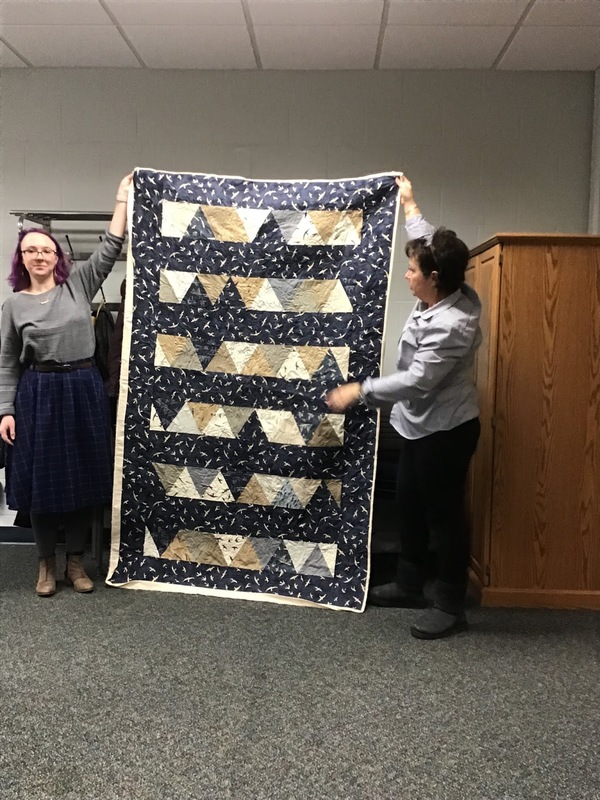 In November, Kate showed us a quilt she was working on for her son, a student at Wentworth Institute of Technology in Boston. Today, she had the finished version. Apparently her son has wrapped himself into the quilt every morning since Christmas! 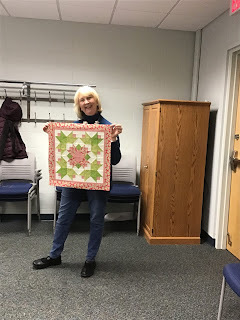 Speaking of Christmas, Mary showed us a red-and-green wall hanging that involved a lot of intricate piecing. Patty is working on a quilt for a bridal shower next weekend. The couple lives at the beach, so the quilting is done in a seashell motif. 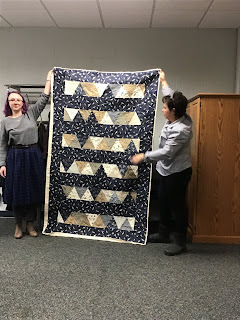 Last but not least, all of us got to see the completed quilt that we'll be sending to Quilt Con, which is February 21-24 in Nashville. 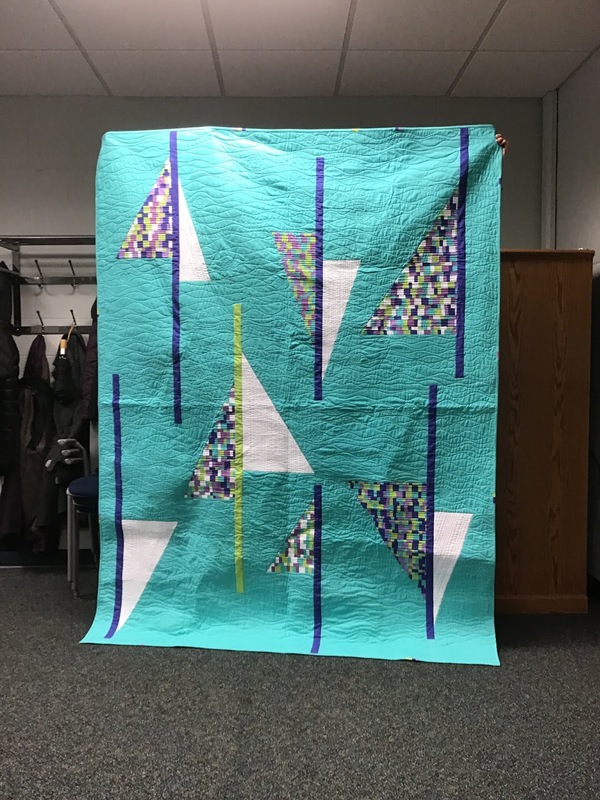 It's entitled "Safe Harbor" and its construction was coordinated by Kelly, our charity projects leader. A view of the front of the quilt is at the top of this post. Below is a view of the back. Suzanne (at right in the picture below) did the quilting. 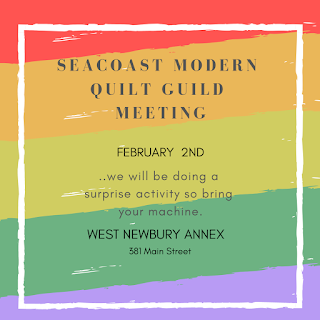 Our next meeting will be 10 a.m. on February 2 at the West Newbury Annex.